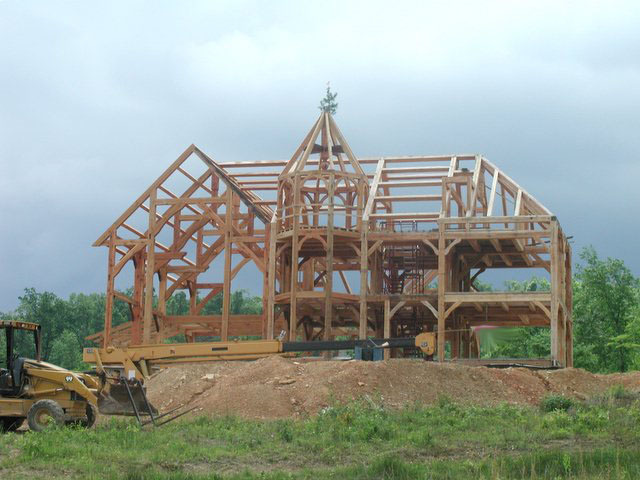 Sorry, one more off topic post and then I'll go back to blogging about timber-framing, living off grid, and being more self-reliant. I promise! This week, I filed with the Kentucky Registry of Election Finance to run as a Republican in our upcoming race for County Judge Executive. One of the reason's we moved back to eastern Kentucky (apart from: perfect climate, great people, down-to-earth culture, reasonable cost of living, and awesome scenery) was because it's about the best place on earth to "homestead." For as long as the land has been settled, the attitude among working people here in Appalachia has been live and let live. But as I mentioned in a previous post, the situation is precariously balanced as our local government grows, while our economy slips backwards. Long story short, I've decided to get involved! My political website is http://www.thomasmassie.com/ . The morning after I filed to run, the sunrise looked like this second picture... is this a bad or good omen? BTW, if you're looking for a great place to get your campaign signs, shirts, knick-knacks, etc. - try Impact Graphics, right here in Lweis County!